the service learning student is actively engaged in the learning. Below, service learning student Austin Steinman engages students in Nanjing China in lessons he co-created, exploring concepts of data encryption technology. Austin was one of eight Purdue undergraduate students in varying disciplines, teaching elementary grade science in a study abroad program led by Physics and Astronomy Outreach Coordinator, David Sederberg. "The Study Abroad experience was life-changing. It helped to reinforce the importance of criticism, as well as teach collaboration and communication even across cultures. It also helped me to understand the importance of learning about and experiencing other cultures to become a better, more well-rounded individual." As the name suggests, service learning is directed toward providing something meaningful and tangible to satisfy a need. 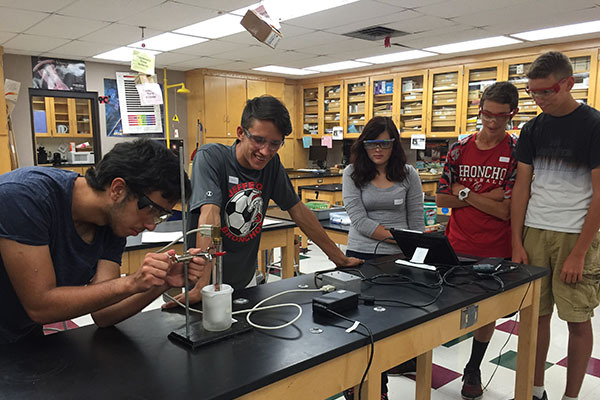 Physics and Astronomy service learning students have designed and taught hands on experiments and activities for on-campus programs like Physics Inside Out and Saturday Morning Astrophysics (SMAP). The SMAP students in the video below are conducting an experiment on concepts related to impact craters. Service learning student Colin Burke created the lesson and experiments, contrasting energy and crater depth and diameter. Colin presented and taught his lesson at SMAP. The projects completed by service learning students contribute in meaningful ways to K-12 classroom science education, learning principles of science in informal or applied learning environments, faculty commitment to broader impact in research, and to the mission of Purdue Physics and Astronomy Outreach. "Programs like the ones we run inspire kids to do better in school or even to go learn about science on their own. It is more than just learning about buoyancy, electric circuits, or gravity, it is helping young learners gain an insight into how the Universe works – and that is something extremely valuable." Service learning is a valuable resource for continuing the mission of Physics and Astronomy Outreach because it enables the offering of programs, which would otherwise be impossible or impractical to pursue. As an example, service learners conceive and teach lessons on the principles of science for Sidewalk Science or afterschool science clubs, and Physics on the Road presentations. "I loved creating the sidewalk science station, "Skateboard Down Charlee Brown" because it allowed kids to visually see proof of inertia and better understand it. Once they saw and complete the Charlee Brown demo a light bulb went off in their head." While providing services and/or deliverables to the "customer," service learning students grow intellectually, personally and professionally from their experiences. That learning may involve leadership skills, experience teaching in K-12 classrooms, pedagogy and the design of instructional materials and assessment, and learning relevant science content. 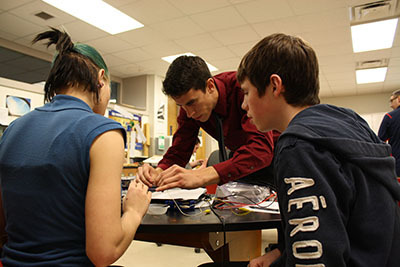 Undergraduate service learning student and future physics teacher Joe Kellenberger is teaching the lesson he designed, The Magnet Problem, in a local high school physics classroom. Service learning students learn methods, techniques, tools, and unique technical skills, which that would otherwise not be available to them. 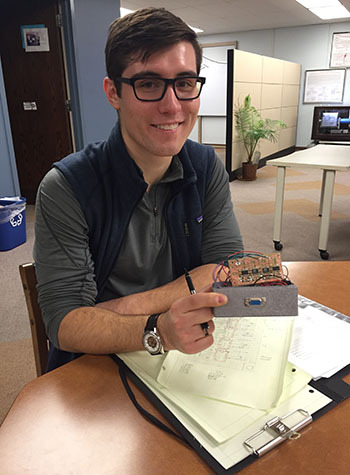 As an example, undergraduate ME major Trey Roob learned machining, integrated circuit design, in the fabrication of a classroom set of 12 cryogenic temperature probes. 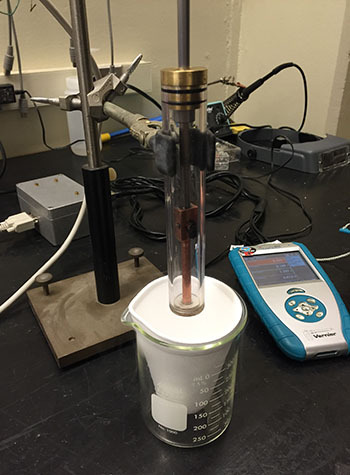 Roob's apparatus allows students to simultaneously measure and graph the resistivity of four materials from ambient room temperatures to cryogenic, using liquid nitrogen. Below, high school students learn the behavior of superconductive materials in an after school program. Service learning provides students realistic opportunities to apply and extend their coursework to the service of others. 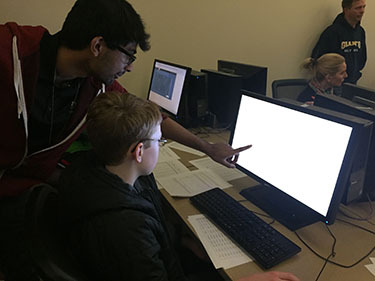 Undergraduate computer science major Guna Kondapaneni wrote and taught a computer simulation at SMAP, with which students were able to learn how scientists are discovering new planets in other solar systems by infinitesimally small changes in star luminosity. An essential component of the service learning experience is personal reflection on learning and experiences. The additional comments below are typical of what service learning students think about their contributions and gains from their experiences. "The boy scout lock-in was probably my favorite thing that we did, because it combined everything we were doing throughout the semester into that one block of time. It’s tricky to try to find the proper way to show AND explain topic to kids without using more advanced equations and full lectures, but it’s nice to figure out how to explain things in a simpler manner. This is also advancing my own understanding of topics. As a physics education student, this sort of thing is what I want to do. I’ve really enjoyed helping students explore science in the little sidewalk science stations. I have always particularly liked being able to show or explore science using common, everyday things, and that’s what this Sidewalk Science is about." "When I first began volunteering, I was a bit nervous about working with the kids, but quickly I learned that they are just as curious and interested in the natural world as physicists, and perhaps more so. I love how we push and develop the curiosity of kids and show them that science is fun." Service learning is a philosophy with which individuals are able to make meaningful contributions to the benefit of others while at the same time developing their own knowledge and expertise in an area of personal interest or commitment. Service learning is based on the principles that learning is most effective when contextualized in authentic applications. While providing authentic deliverables to the “customer,” students enrolled in service learning courses learn from their experiences. That learning may involve leadership, the communication of science related ideas and principles to the public, experience in teaching in K-12 classrooms, the design and creation of instructional materials and assessment, and, above all learning relevant science too. A component of the service learning experience is personal reflection on the experience. The project products of students in the service learning courses are commonly the kinds of materials and apparatus that contribute in meaningful ways to K-12 science classroom teacher practice, as well as to the broader mission of Purdue Physics and Astronomy Outreach. 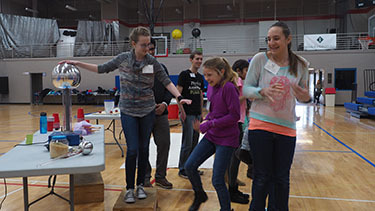 Physics 295 is a service learning class available to students who would like to contribute and participate in the presentation of lessons in physical science to K-12 classrooms or other public events. Students are required to prepare and rehearse labs/activities so they are able to offer professional presentations. Students are also required to maintain a reflection journal, where they record notes about and reflect upon their experiences. Although efforts are made to work around students' schedules, students should have at least on open morning or afternoon each week (2-3 hours) that allows them to devote sufficient time to project design and implementation. One credit is equivalent to 32 hours of involvement in preparation and/or delivery of activities, and journaling time. Learning Objectives: 1. Learn to apply fundamental principles of instructional design and/or assessment of learning. 2. Contribute to and/or develop and deliver age-appropriate outreach experiences for learning of scientific concepts. 3. Critique and reflect upon personal insights related to outreach experiences. Location: Login to MyPurdue for class times and locations. 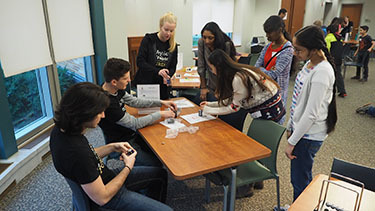 PHYS 59500 builds on collaborative interactions among current Purdue Physics or Education students, K-12 science educators, Physics and Purdue College of Science faculty, and Physics Outreach. The goal for this course is to provide opportunities and mentorship for independent work that could include the design, piloting, and assessment of instructional materials, relevant to learning and teaching topics and concepts related to the physical sciences. With a “service learning” orientation, students enrolled in this course should expect to learn and build upon the fundamental principles related to the design and implementation of instructional materials in classroom or informal learning environments, and assessment of learning. Materials developed could contribute to the repertoire of practicing teachers and/or Physics Outreach. Learning Objectives: 1. Learn to apply fundamental principles of instructional design and/or assessment of learning. 2. Develop creative and engaging age-appropriate opportunities to promote the learning of scientific concepts. 3. Critique and reflect upon personal insights and experiences related to non-traditional and informal science education. Login to MyPurdue for class times and locations. Physics 290M provides an opportunity for undergraduates to become proficient in the set up and use of cosmic ray detector hardware and in the development of demonstrations and activities that support Indiana high school physics curriculum, based on the goals of the QuarkNet program. QuarkNet provides a way to introduce fundamental high-energy physics and astro-particle physics research to high school teachers and their students. Students enrolled in 290M provide the expertise to high school teachers to maximize the benefits provided by the QuarkNet outreach program while minimizing the additional time and effort required to implement it in the classroom. 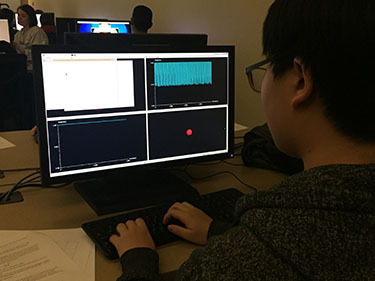 Students enrolled in Physics 290M will be provided resources to significantly enhance the benefits that high school teachers receive from their participation in the Purdue QuarkNet program. Moreover, they are positioned to significantly impact learning in high school science, mathematics, and technology classrooms.